Abstract: ReservoirBench is an interactive workbench for educational geological science and engineering tasks. It is designed to facilitate education of novice audiences to teach them basic concepts of reservoir modeling and simulation workflow. Traditional training using lectures and software practice can lead to information overload, and retainability is questionable. As an alternative, we propose a physical workbench that is coupled with digital augmentation for the purpose of learning. We take advantage of the crucial role that spatiality and 3D representations play in petroleum reservoir modeling and allow basic domain concepts to be introduced and explored in a tangible and experiential manner. We describe the design of our prototype and reflect on the findings from our preliminary design critique. S. Somanath, A. Rocha, H. Hamdi, E. Sharlin and M.C. 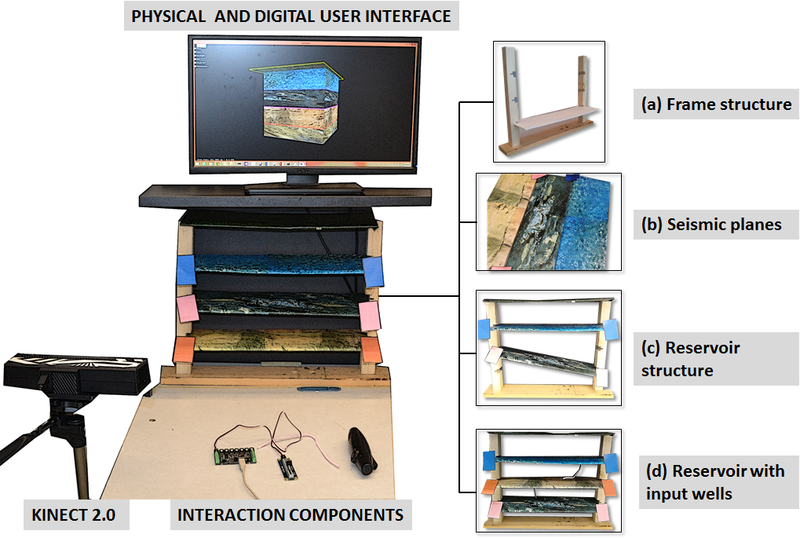 Sousa, “ReservoirBench: An Interactive Educational Reservoir Engineering Workbench”, Proceedings of the 15th IFIP TC.13 Interactional Conference on Human-Computer Interaction (INTERACT'15), 2015. Bamberg, Germany.